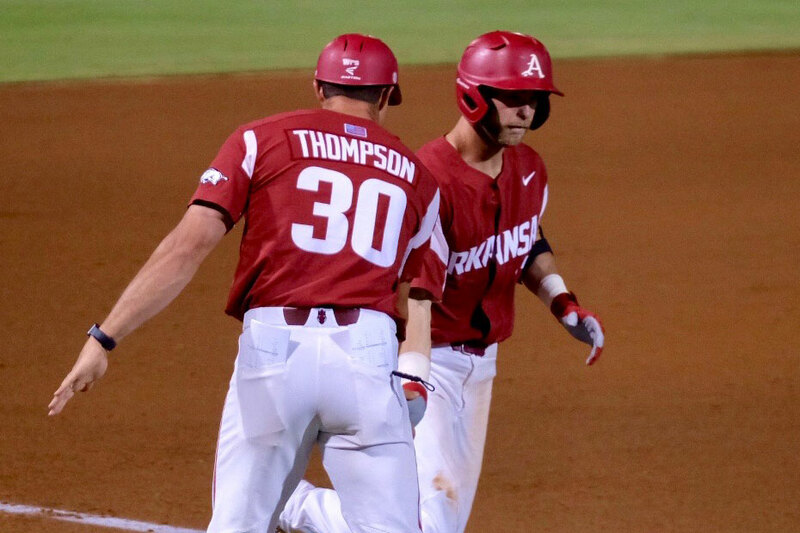 ATHENS, Ga. – Trailing 4-2 heading into the 7th inning, the fifth-ranked Razorback baseball team put up a six-run frame, punctuated by a go-ahead two-run home run by senior Luke Bonfield, and was able to hold on for the final two innings for an 8-6 series-opening victory over the 13th-ranked Georgia Bulldogs Thursday night. Arkansas (37-15, 18-10) scored all of its runs in the first and seventh innings, en route to its fourth-consecutive conference victory. In the big seventh inning, the Razorbacks sent 10 batters to the plate, utilizing five hits, three being singles, along with the homer by Bonfield and a triple by Dominic Fletcher. It was Bonfield’s eighth long ball of the year and second in as many games. He finished the game 1-for-3 with two runs scored and the two RBIs, He also extends his hitting streak to four games and the two RBIs marks his eighth multi-RBI game this year. With the win, Arkansas holds it’s one-game lead in the SEC Western Division, as the Ole Miss Rebels won their game tonight as well. The Hogs now have 18 wins in conference play, matching their total from a year ago. The victory is also Arkansas’ sixth straight over Georgia and 10th in its last 11 games in the series. In five of their last six games against the Bulldogs, the Hogs have scored eight or more runs. The Arkansas batters in spots 1-6 accounted for all 11 of the team’s hits Thursday night. Casey Martin, Heston Kjerstad, and Dominic Fletcher all turned in multi-hit games. Martin went nearly perfect at the plate, going 4-for-5 with four-consecutive singles in his first four at-bats. It was Martin’s second four-hit game of the season, his last coming on Feb. 17 against Bucknell, where he went 4-for-6 with five RBIs. The Lonoke, Arkansas native has at least one hit in 16 of his last 21 games and has notched two hits or more nine times over that same span. In his last eight games, Martin is hitting .412 (14-for-34) with five multi-hit games. Fletcher also continued his strong hitting tear in conference play, going 2-for-5 with a triple and a run scored. The three-bagger came right after Bonfield’s home run in the seventh inning and was the second triple of his career. In his last 15 games, Fletcher is hitting .386 (22-for-57) with 12 RBIs and seven extra-base hits. Junior right-hander Blaine Knight locked up his ninth win of the year, remaining undefeated, with a six-inning outing and just two earned runs allowed. Arkansas caught the error bug early on as it committed three errors, its sixth game with three or more errors this year. The two earned runs given up by Knight were only solo homers from Cam Shepherd in the second and Adam Sasser in the fourth. Knight ended up only giving up one hit in his final 2.1 innings, striking out two in the sixth. Sophomore Matt Cronin made his second appearance in as many games and ended up with his 10th save of the year after pitching the final 2.2 innings. Cronin faced 11 batters and allowed just one run on three hits. He finished the game with a 1-2-3 bottom of the ninth and is now just three saves away from tying the Arkansas all-time single-season saves record set by Colby Suggs in 2013. Arkansas and Georgia will play game two of the three-game series on Friday at 2 p.m. at Foley Field. Originally scheduled for 6 p.m., the threat of inclement weather forced the game time to be moved up four hours. The game will still be televised online on SEC Network+.